Founded in 1937, the Toyota Motor Corporation is a Japanese-based multinational automotive manufacturer that produces cars, trucks, and motorcycles under five brands, including the luxury brand Lexus and the Millennial-aimed brand Scion. The main focus of the company is the automotive industry, but Toyota is also involved in the field of robotics and material handling. 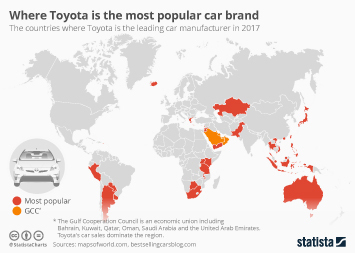 Toyota was stalled from recovering financially from the worldwide recession that started in 2008 by a series of recalls and natural disasters not just in Japan, but in other production center locations, such as Thailand. Toyota's revenue finally surged back in 2013, and, despite recent problems with air-bag inflators, the company managed to garner the position of most valuable car brand worldwide in 2016, beating out competitors such as Mercedes-Benz, BMW, and Honda. In the fiscal year ended March 31, 2018, the company reported revenue of around 29.4 trillion Japanese yen. The Toyota Motor Corporation made strides in the electric vehicle market by being the first and largest automobile company to offer a hybrid car in its line-up. The Toyota Prius was such a success that the company also began to provide a hybrid option for some of its other models, such as the Camry and the Avalon. Recent statistics show that Toyota has received consistently higher than average customer satisfaction ratings since at least 2006.